After appearing to set up a vote to send the Transportation, Housing, and Urban Development spending measure to be sent to a Conference Committee it now appears that the spending measure will not be completed before the end of the Fiscal Year on September 30. A continuing resolution was passed and signed into law by President Trump on Sept. 28 which will extend funding at FY-2018 levels for a number for HUD, USDA and a number of other agencies T-HUD through December 7. The Senate passed on August 1 a four spending bill package (HR 6147), including its Transportation, Housing, and Urban Development bill (S. 3023) which would increase appropriations for HUD by 4% over last year’s funding amount, while the House version would increase HUD funding by roughly 2%. 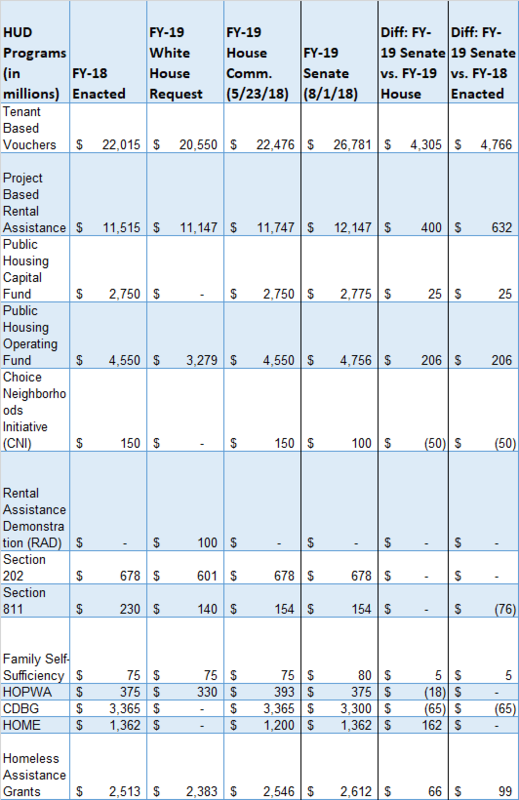 The Senate spending measure authorizes an additional $4.3 billion in Tenant Based Vouchers and an additional $400 million in Project Based Rental Assistance over the House’s T-HUD funding language. While the House would provide level funding for The Choice Neighborhoods Initiative and CDBG, the Senate proposal cuts funding by $50 million and $65 million, respectively. Both measures would increase overall HUD funding, rejecting the White House request to cut funding by almost $11 billion.